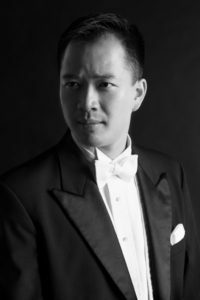 Derek Tam has been appointed Executive Director of the San Francisco Early Music Society. He succeeds Harvey Malloy, who served from 2009 until his retirement last fall. His appointment to the top leadership position with SFEMS will be especially important in the planning of the 2020 Berkeley Festival and Exhibition. Derek Tam has become known to the Bay Area early music community over the past several years for his solo and chamber performances on harpsichord and fortepiano. He currently serves as conductor for the baroque opera company Ars Minerva and directs the baroque chamber ensemble MUSA. He also directs the choir programs at First Church in Berkeley, where he has established a successful, new concert series. Tam said his interest in working for the Early Music Society is rooted in a passionate, personal conviction about the value and positive power of classical music, coupled with a recognition of the vital role that SFEMS has played in developing the Bay Area’s early music community, and a belief that the Society is uniquely placed to foster and sustain that community’s next generation. In demand as a conductor and historical keyboardist, Derek Tam performs regularly in the Bay Area and elsewhere. He has appeared recently with Ars Minerva, Bay Pointe Ballet, the First Church Festival Orchestra, Oakland Ballet and the Oshman Family JCC. Tam has also performed with leading period ensembles such as Voices of Music and Musica Pacifica, and has served as principal keyboardist for most of the professional symphonies in Northern and Central California. In addition, Tam is a founding member and harpsichordist, and occasional conductor, for MUSA, a San Francisco-based Baroque chamber ensemble. His fortepiano trio, the Costanoan Trio, performed at the 2018 Early Music America Emerging Artists Showcase. Tam’s administrative experience includes serving as Director of Music at First Church Berkeley (First Congregational). In this role, he produces Resonance, the church’s critically-acclaimed performance series. He is also the Executive Artistic Director of the Star Valley Children’s Choir in San Francisco. Tam has served on the faculty of the NAPA Music Festival and the San Francisco Early Music Society Recorder Workshop. He has also served on staff at the American Bach Soloists Festival & Academy. He is a member of the Board of Early Music America, a national organization dedicated to strengthening historical performance. Tam holds a license with the California Tax Education Council, and a Bachelor of Arts from Yale University, where he majored in music and political science. “The search committee was impressed with Derek’s knowledge and passion for historically informed early music performances, his demonstrated leadership skills, and his acumen for the financial management of an organization such as SFEMS,” said President Hamilton.